ATTENTION: TAO-MAT-7428-PP PRO-PLUS (PEMF) InfraMat Pro is for professional use only. SPA, Medical office, Therapeutic centers. Please send us your business verification before purchase. The full mat can comfortably fit on any area of the body, promoting general wellness and overall health. This mat contains pounds of healing stones to further increase the general wellness experienced by the user. The stones in this mat are amethysts, tourmaline and obsidian. Each stone has healing properties for both the mind and the body. By combining the unique healing properties of all stones with the heat from the InfraMat Pro, the body experiences relaxing health improvement and a radically extraordinary detoxification. New model with build in PEMF. Pulse magnetic of Earth frequency of 7.8 Hz with Intensity of 3 Gauss. Field is the same the mat surface and two feet above, means whole body stay at the same powerful healing pulse magnetic field. Once PEMF button pressed – function goes for 20 minutes and then go to a sleep mode for 100 minutes, then goes live again for 20 minutes. That found to be most safe and productive. If you need to continue PEMF function you can just off/on the button after 20 minutes. 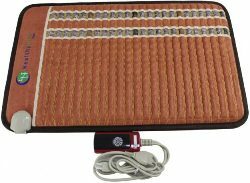 PEMF button works independently with or without other mat functions.